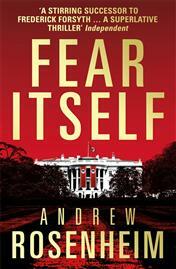 Andrew Rosenheim's ‘Fear Itself’ – easily my favourite thriller from 2011 – was a slow-burning, tension-ratchetting what-if conspiracy thriller, rich with period detail about pre-war America, reminiscent of both Robert Harris and Frederick Forsyth. So I've been eagerly awaiting the sequel. 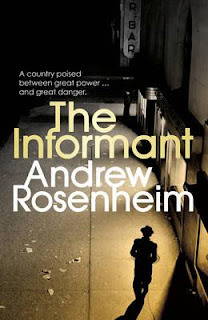 The Informant was published earlier this month - and hasn't disappointed. The bulk of the action switches from the East to West Coast as FBI agent Jimmy Nessheim finds himself - on the recommendation of J Edgar Hoover - as an ‘adviser’ to a Hollywood film studio, which is churning out dubious gumshoe flicks giving a positive spin to Hoover's fledgling FBI. Andrew, thanks for agreeing to be interrogated for the blog! We left Jimmy at the end of ‘Fear Itself’ having foiled a high-level assassination plot designed to keep the US out of the war. What has happened to Jimmy since then, and where does The Informant start? 'The Informant' begins with Nessheim in Hollywood in autumn 1941. He feels he’s spinning his wheels. He tried to enlist in the army, but was turned down on medical grounds. Now the rest of the world is at war and America seems on the brink of joining in; yet all Nessheim’s doing is acting as a ‘technical adviser’ on pro-FBI movies made by a low-rent studio. Then a Japanese-American informant named Billy Osaka goes missing, right after sending Nessheim a message saying he needs to see the FBI man urgently. Almost simultaneously, Nessheim’s boss Harry Guttman is approached by a State Department diplomat who claims the Russians want him to spy for them. When the diplomat is murdered, a California connection emerges, and suddenly Nessheim finds he’s busy on all sorts of fronts. Jimmy is not your average G-man – as he says himself, he’s an ‘accidental Agent’ who entered the Bureau by chance and feels very ambivalent about his job. He’s protected to some extent by his immediate boss, Harry Guttmann, but both increasingly go out on a limb in their hunt for Billy, and to a large extent are at the mercy of the whims of J Edgar Hoover and his cronies. Hoover is a much bigger – and more conflicted – character in this book, and I wondered what your views on him are having spent some time getting inside his head for the book? 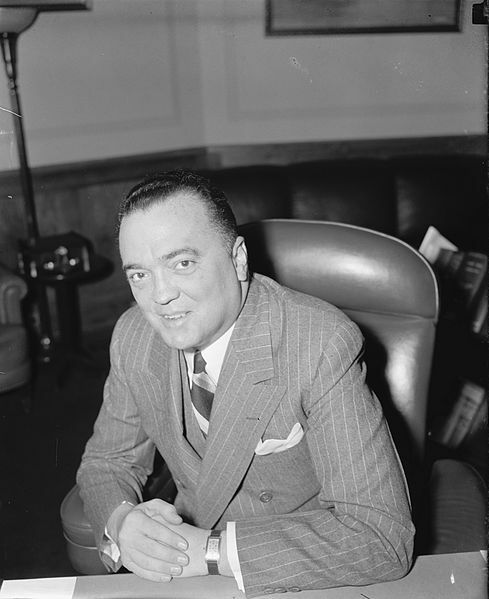 I think Hoover as a young man was an upright, ambitious and highly intelligent man who brought a much-needed professionalism to the FBI. Unfortunately, his extraordinary early success went to his head, and he began to run the Bureau as a fiefdom, in which his image and the FBI’s were conflated, in which even the mildest criticism was seen as a personal attack. He became prone both to delusions of grandeur and almost limitless vanity (the two go hand in hand), yet he remained extremely cunning, and showed great savvy in manipulating the powers in Washington who might challenge his supremacy – from Congressmen to Presidents. Yet as I hope THE INFORMANT demonstrates, he allowed his egotism and his prejudices (which were deep and wide-ranging) to affect his judgement, sometimes to America’s cost. Much of the action takes place in California, amongst the Japanese immigrant community and Hollywood. I found a lot of the detail surprising in terms of the pro-Soviet feeling, and the close ties the Japanese immigrants still had with the mother country. What kind of research did you have to do for the book, and were there things you learned that surprised you? I like doing research, though I try not to like it too much – I think some historical novelists overegg the research sometimes, at the expense of their story. For this novel I read a lot about the politics of the time, about Hollywood in the ‘20s and during the War, and about the Japanese-American community in Southern California. I also had help from individuals, including my uncle, who probably knows more about the history of American transport than anyone in the world, and from a Japanese-American historian who now teaches in Kyoto but who grew up in and has written extensively about Los Angeles. Like ‘Fear Itself’, I really loved ‘The Informant’. I may be biased, as the period in which they are both set – the years leading up to America’s entry into the Second World War – is one that I find particularly fascinating. Is this why you chose to set your books in that time period? I find the period fascinating, especially for America. It was still a young and young-acting country, soon to be thrust into a new role as a leading power. It’s the mix of innocence and unfettered might that fascinates me, as well as the ethnic and racial diversity of the country, and its multiple kinds of climate and terrain. I’m also intrigued by how a nation changed in such a short period of time, emerging as a superpower in spite of the huge social pressures on it given its immigrant make-up. In ‘Fear Itself’ you explored some of these pressures through ‘The Bund’ and Jimmy’s German heritage, but there were very different social dynamics in the Japanese immigrant community – how were you able to explore these? Well, in many ways the Japanese and German communities in America were similar in that both contained very different views of their former homelands, ranging from young second or even third-generation members (such as Billy Osaka or Nessheim himself) who wanted to be fully American, to older members who often had strong residual loyalties to the Emperor or Fuehrer. It’s the mixed nature of their allegiances that made me initially interested in both the German-Americans and the Japanese-Americans. I suppose I have gone native to a degree, though my accent certainly hasn’t. I’ve always enjoyed British spy fiction, and I’ve always been interested in British Intelligence. It was far better established in the era I’m writing about than American Intelligence (which didn’t even exist overseas), and had a lot to teach the FBI. Not that Hoover in my book is willing to listen -- but my character Harry Guttman is. There’s great evocation of place too, particularly in California. There’s a wonderful description of Jimmy driving up to a ranch for a weekend party, and cresting over a hill to view a lush, green valley in the heart of the wine-growing region. I could easily imagine this was a real place you visited. Did you have to – reluctantly (!) – do any research by visiting these areas? I worked one summer many years ago in Santa Barbara and have clear memories of the town and its surrounding countryside. I also used Ronald Reagan’s ranch as a hazy kind of model for the ranch in The Informant. I actually didn’t go to LA for the book, however, since the LA of 1941 is pretty hard to find there today. One source which proved invaluable was a guidebook to Los Angeles published in 1939, composed by a bunch of writers who had jobs with the Work projects Administration (WPA), a government agency which employed them during the Depression. To discover such a detailed source from the actual period I was writing was a tremendous find. Your description of the clothes various characters wear seems an important theme in the book – the suits, shirts and shoes seem to act as a shorthand to define class and cultural differences, or the difference between the agents of the law and the people under investigation. It really adds to the sense of paranoia and mood-setting, and I wanted to know if that was deliberate? I think this kind of detail is crucial in establishing an atmosphere and making the overt historicism of the book seem authentic, as well as revealing the distinctions between characters. As I say, you don’t want to overdo it, or else describing the stripes on a bow tie and giving the brand of someone’s shoes followed by the shirt’s manufacturer’s name can get in the way of the characters you are creating. Jimmy seems to be on the verge of leaving the FBI at the end of the book, but is given some tantalising information and a new challenge that suggests another book. What – if anything – can you reveal about what Jimmy is going to do next? Nessheim will be in the Midwest of America in autumn 1942, where a top-secret project is underway at the University of Chicago to create the first controlled nuclear chain reaction, under the leadership of the famed Italian physicist Enrico Fermi. Even Hoover doesn’t know about the Manhattan Project (as it came to be called) during this early stage, but Nessheim’s boss Harry Guttman does, and enlists Nessheim to protect the secrecy of the project. The 1930s is such a fascinating decade with so much going on - and it's the busy-ness and tension as things build towards WWII that fascinates me, so I'd love to read this book.